a couple years ago I wrote an article about 'Are the high street taking a step too close' sighting that the high street were imitating designers, rather than being inspired by them. It is a thing that happens, in the past I had a company do an exact copy of the Vanjo soft bra. When I enquired about it, they replied that their designs were their own, in situations like that, you'll never know if you were right or they were. 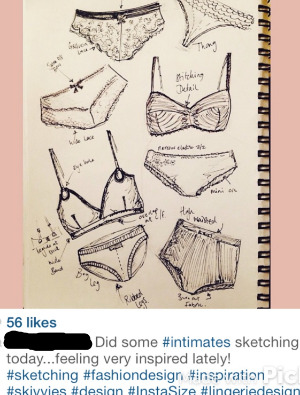 Then last week, I noticed on Instagram that someone had taken my sketches and stated, that they were their own. I have been messaged since when I questioned it, that it was done in an error. However I can not state enough - if you are thinking of becoming a lingerie designer, have conviction and self belief in your own designs. You are obviously thinking of becoming a designer because you believe you have an idea which the world needs to see. You don't need to copy anyone else, otherwise you won't get that far.